La Plata Electric Association, with offices in Pagosa Springs and Durango, works with members — both residential and commercial — to change out their lighting to new, energy efficient lamps. The cost to purchase new lighting all at once can be cost prohibitive, so the electric cooperative has been prudent with its members’ money as it too worked to change out lighting in all of its buildings. Ray Pierotti celebrates the appearance of “daylight” in LPEA’s warehouse. LPEA’s administrative offices were steadily replaced and are now 100 percent LED. With the office light retrofits, energy-saving controls were also installed, including dimmers and motion sensors. Work lighting for office employees is greatly improved even with the energy savings. Pierotti is perhaps most excited about the projects that replaced the lighting in the warehouses. Previously dimly lit with old technology, the warehouses now appear to be illuminated by daylight. “The difference is just amazing,” Pierotti says. The total reduction in kilowatts with all the office space, warehouses, truck barns, exterior and other lights changed out is nearing a combined 100 kilowatts, which, according to Pierotti, saves the cooperative more than 260,000 kilowatt-hours in both locations and more than $30,000 annually going forward. Just like all of LPEA’s commercial members who opt to change out their lighting and reduce their energy consumption, LPEA benefitted from rebates provided by its wholesale power supplier, Tri-State Generation and Transmission. Tri-State benefits by encouraging members to reduce energy consumption so the company doesn’t need to build additional generation facilities. Outdated lighting, heating and cooling can cost rural schools, on average, 30 percent more on their energy bills, according to a recent study by the U.S. Environmental Protection Agency. 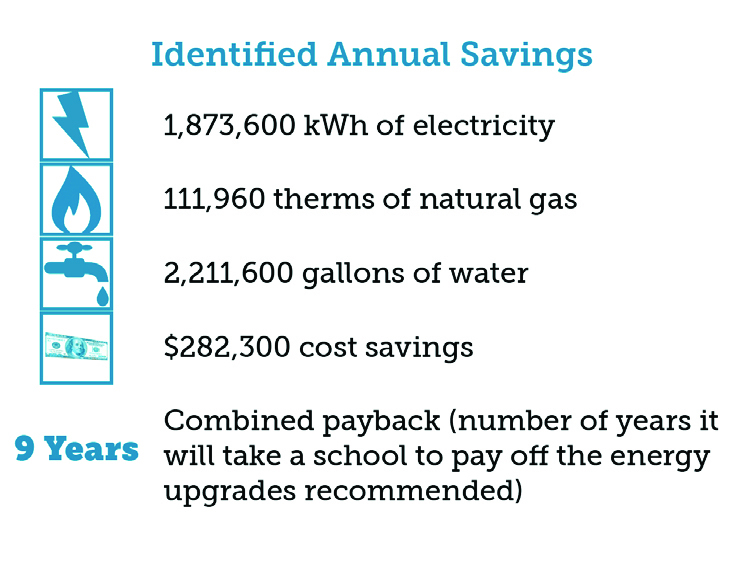 To combat this problem, the Colorado Energy Office’s Energy Savings for Schools program is under way and able to support up to 12 more schools this year. To date, 23 schools received their energy reports and began implementing projects. The graphic to the left outlines the collective potential savings identified for these schools. Legacy Academy is poised to save $13,420 annually as a result of lighting upgrades, ceiling fans and water fixture upgrades installed this year. In addition, with support from the ESS program, Legacy Academy applied for and was awarded Energy Star building certification in November as a result of its efforts to improve efficiency. Energy Star certified buildings outperform 75 percent of similar facilities across the country. 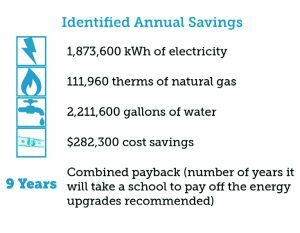 Don’t let your local school miss out on ESS resources to optimize energy performance and save money. CEO is actively recruiting schools from Colorado’s rural and low-income areas to participate in the program’s second year. If you know a school that might benefit from the program, share this information with a school representative or contact the program manager, Susan Blythe, at SBlythe@BrendleGroup.com or 970-207-0058 ext. 310. More information is available at bit.ly/CEOenergysavings.